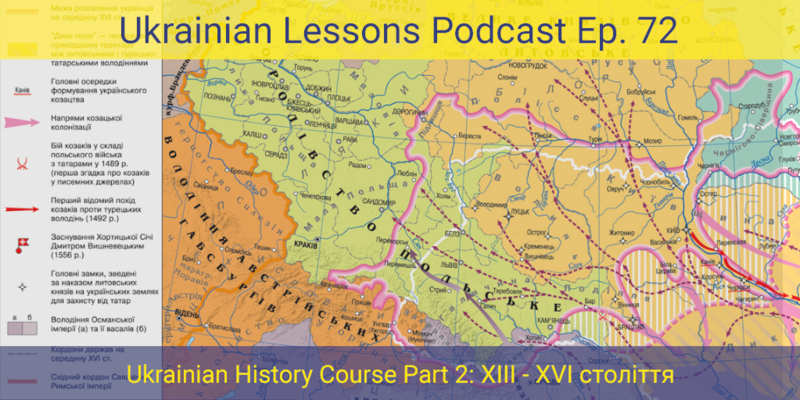 Частина 2 курсу історії України – Part 2 of the Ukrainian History Course! 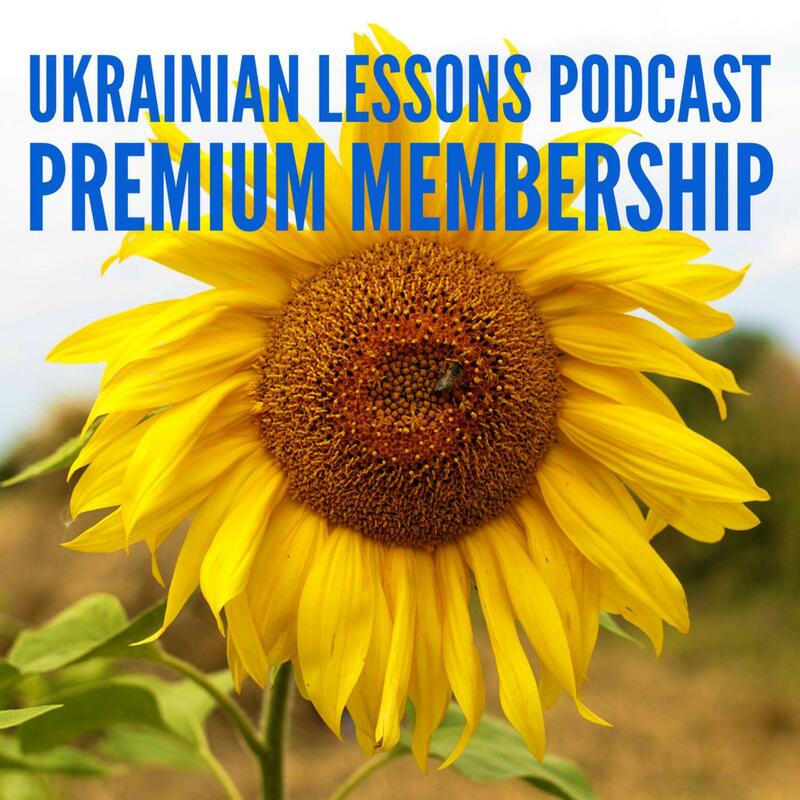 Discover the Ukrainian history of the 13th – 16th centuries and learn Ukrainian at the same time. Before listening, don’t forget to check the important historical vocabulary below. Enjoy! discover some interesting statistics about religion in Ukraine. Галицько-Волинське князівство – Kingdom of Galicia-Volhynia in the West of modern Ukraine (1199–1253). Роман Мстислáвич, Данило Галицький, Юрій Львович – the biggest rulers of Галицько-Волинське князівство. Велике Князівство Литовське – The Grand Duchy of Lithuania – a European state from the 13th century until 1795. Галичина – Galicia, modern regions of western Ukraine: Lviv, Ternopil and Ivano-Frankivsk. Волинь – Vohlynia, a historic region of north-western Ukraine. Some important modern cities are Lutsk, Rivne, Volodymyr-Volynskyi, Iziaslav, and Novohrad-Volynskyi. Київщина, Переяславщина, Чернігівщина – names of the historic regions, namely around Kyiv, Pereyaslav, and Chernihiv. Кревська унія – Union of Krewo, which marked the beginning of the four centuries of shared history between Poland and Lithuania. Вітовт – Vytautas, also known as Vytautas the Great from the 15th century onwards, was a ruler of the Велике Князівство Литовське. Кримське ханство – The Crimean Khanate, a Turkic vassal state of the Ottoman Empire from 1478 to 1774. Османська імперія – The Ottoman Empire, also historically known in Western Europe as the Turkish Empire or simply Turkey, was a state that controlled much of southeastern Europe, western Asia and northern Africa between the 14th and early 20th centuries. Кримські татари – Crimean Tatars are a Turkic ethnic group that formed in the Crimean Peninsula during the 13th–17th centuries, primarily from the Turkic tribes that moved to the land now known as Crimea in Eastern Europe from the Asian steppes beginning in the 10th century, with contributions from the pre-Cuman population of Crimea. Since 2014 Crimean Tatars were officially recognized as indigenous peoples of Ukraine. Московське князівство (1283-1547) – The Grand Duchy or Grand Principality of Moscow, also known in English simply as Muscovy from the Latin: Moscovia, was a late medieval Rus’ principality centered on Moscow and the predecessor state of the early modern Tsardom of Russia. Річ Посполита (1569–1795) – The Polish–Lithuanian Commonwealth was a dualistic state, a bi-confederation of Poland and Lithuania ruled by a common monarch. It was one of the largest and most populous countries of 16th- and 17th-century Europe. Шляхта – szlachta was a legally privileged noble class in the Kingdom of Poland, Grand Duchy of Lithuania, Ruthenia, Samogitia and the Zaporozhian Host. Берестейська унія – The Union of Brest was the 1595-96 decision of the Ruthenian Orthodox Church to break relations with the Eastern Orthodox Church and to enter into communion with, and place itself under the authority of the Папа Римський – Pope of Rome. The result of the Union of Brest was греко-католицька церква – Greek Catholic church.